One of my favorite events of this year was working at Complex Con. Not only was the turnout huge, the energy of the place, people, and fellow vendors was amazing. The weather was also perfect and it was so fun to serve alongside our Bowltenders. We started our intern program this year and it's been such a joy to see the wonderful interns that choose to spend their time here at Amazebowls. One of our interns is now an employee at Amazebowls (Hi Kim!) and we're so happy she's here. Visiting Oh Joy's team is always such a treat and this year, we made them custom bowls with their names on it! We used letter cutters to cut each team's name with fruit for their bowl. Working the Revolve event at Coachella this year was, to me, such a good reflection of how far our team has come since we started catering big events. It was a great display of our teamwork, passion for Amazebowls and dedication to the Amazebowlers (old or new) who love our product! Oh, and we got to see Beyoncé on the main stage, so that was coo too. The introduction of a ginger bowl!? Say WHAAAT! I'm all in!! Starting to work at Amazebowls is definitely on my top. I am super thankful for this opportunity and all the new skills I have been learning. It's also amazing to be able to put my knowledge and creativity to use. Thank you, Bryan and Stephanie, for seeing my potential and gracing me with this opportunity. I know it hasn't happened yet, but I am so excited to make ASMR with Amazebowls brand! I've been watching ASMR for about 10 years now. I discovered it when I was 12 and it has helped me relax. I'm excited to smooth and soothe Amazebowlers! The creation of the Bowldak Yellow! Wondering why the IG feed has been yellow! It's usually because of me and the fact that I love the yellow bowl and think its absolutely gorgeous color. I'm so thankful this delicious bowl was created. Meeting all the amazing people on the team who make work so fun and are a pleasure to work with! I loved the creation of the rainBOWLS and seeing the idea come to life. It was great to watch the process unfold and finally see the finished product. My favorite event was "Run for the Oceans" with Adidas because it was for a great cause. The event was full of great energy from the runners who were excited to be there and enjoyed eating Amazebowls! As a plus, Anderson Paak also performed at the end of the event! 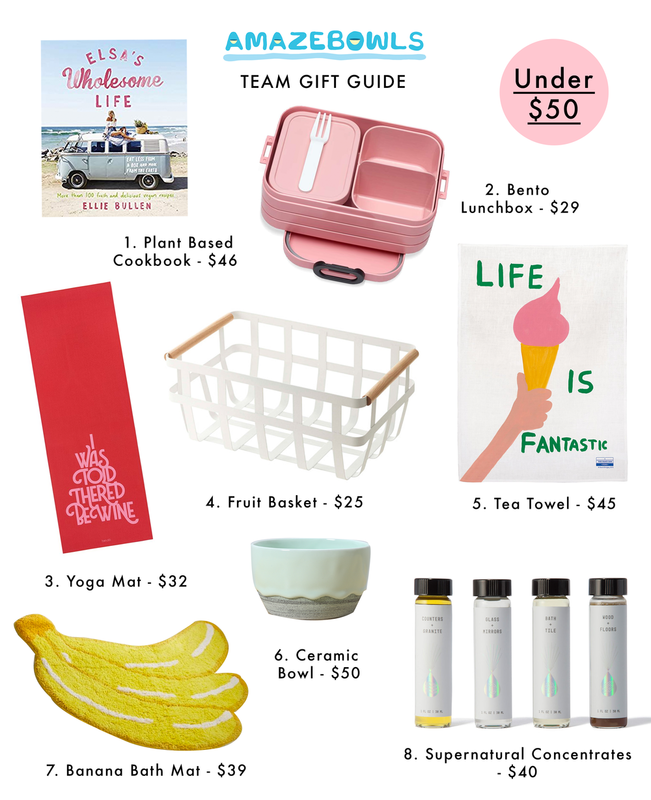 We’re back again for another gift guide for your friends and loved one! We’ve rounded up another set of gifts (under $50) that are good for the planet, soul, body, and mind. Some picks are some fun fruit ones, but again, we’re Amazebowls — we can’t help ourselves! Enjoy! Elsa’s Wholesome Life Cookbook (Amazon) - $46: We love following Elsa’s (@ellie_wholesome) worldwide travel adventures on her Instagram and we were delighted to see that she put some of her plant based recipes in a cookbook with lifestyle tips, nutrition information and wonderful imagery — just like her insta. Bento Lunchbox (Rosti Meptal) - $29: Minimize plastic ziplocs and waste by bringing your lunch in this colorful bento box! We love the different compartments for food storage! Yoga Mat (Ban.do) - $32: Our friends at ban.do are some of the nicest ladies (and men!) you’ll meet, and we love their “life simply should be fun” mantras. Fruit Basket (Container Store) - $25: Store your fruit at home in this simple, yet functional piece of design you can place on your kitchen counter. Tea Towel (David Shrigley) - $45: We love artist, David Shrigley. How great is this feel good print? It makes us feel real happy. It’s a tea towel, but also a perfect piece to get framed. Ceramic Bowl (Brian Giniewski) - $50: Enjoy cereal, ice cream, your acai bowl, Amazebowls in Brian’s handmade creation, or simply use it as a catch all. The burst of colors reminds us of our bowls dripping! Banana Bath Mat (Urban Outfitters) - $39: We see bananas everywhere, all the time in our business. It only made sense to have bananas in the form of a mat in our bathrooms too. Supernatural Concentrates (Goop) - $40: Alongside what we eat, what we breathe is an incredibly crucial part of health and wellness. These concentrates are plant and mineral based cleaning solutions made with essential oils. You mix with water and you can use them in all the different areas of your house! Time to say goodbye to those nasty chemicals! Fruit Sugar vs. Refined Sugar: What's The Difference? In a world of nutritional guidelines and #HealthyEatingGoals, sugar often gets a bad rap. Most of these claims aren’t unfounded – studies after studies show that a significant increase in sugar intake may cause a score of health related issues, including diabetes, obesity, and health disease, among other issues. But are all sugars created equal? Our team recently had a conversation about whether or not fruit sugar should be lumped into other well-known sweet nothings – say, table sugar, sweeteners, honey, and juices. We decided to do some investigating and came back with the following conclusion: fruit sugar is much better for you than refined sugar – and no, they're not created equal. Since we’re all about making healthy eating fun and accessible, we’d love to share what we’ve learned and how we’re still keeping it real (read: good for you) with our products and ingredients. If we’ve piqued your interest, read on! So, what is the difference between “fruit sugar” and “refined sugar”? What kind of sugar do we use at Amazebowls? We keep our bowls – the base and toppings – as clean and wholesome as possible! In other words, we only use whole fruits (and optional agave syrup topping – we’ll explain this more below). No fruit juices or any other secret ingredients, we promise. So, about that agave. Isn’t agave considered sugar and is it even good for you? Agave nectar (most known as agave syrup) is a popular sweetener in the natural health community, and is often touted as a healthy alternative to regular sugar. While the jury is out on whether agave is wholly and definitively a healthier substitute, the key here is moderation. When we get fruit that’s lacking taste due to season, we may add one tablespoon of agave, but never more than that – we’re serious about keeping our products with minimal non-fruit sugar. 1. A sugar free crunch alternative we like is using a blend of almond nuts, cacao nibs, flax seeds, and chia seeds instead of granola. 2. You can ask for light granola, or a blend of sugar free and another choice of granola. The key here is also moderation. We are working on expanding our sugar free granola line… more to come soon! How is Amazebowls different from other acai bowl companies? Our mission is to make healthy eating fun and accessible for everyone – without compromising on quality and taste. This means that we only use pure form and zero sugar acai/pitaya and fresh frozen fruits in our base. We blend fruits whole as opposed to using juices, so we can maintain the fiber and nutrients in our bowls. And, we top our bowls with even more fruit, as well as other protein-based and healthy fat toppings, so our customers have a well-balanced option. Got any other questions for us about sugar and our products? Leave us a note in our comment section or read our nutritional content Q&A here!